Say whaaaat? I know, most of what you are used to seeing for newborns is either in a studio or in someone’s home. And yup – I love those too! But, when the family is up for it, I loooove using some of the best of nature, no matter the season, to incorporate into the session. And we did just that, capitalizing on the green and verdant landscape that is the East Coast in the throes of August. Happily, my trips back to Pennsylvania to visit family and do destination photo sessions seem to coincide with my brother and sister in law and their new baby arrivals. I bet they time it around my summer visits! Ha. But really, I love that I have had the chance to photograph both of my nieces as newborns, despite living clear across the country. I happened to be present only days after Adalyn came into the world. 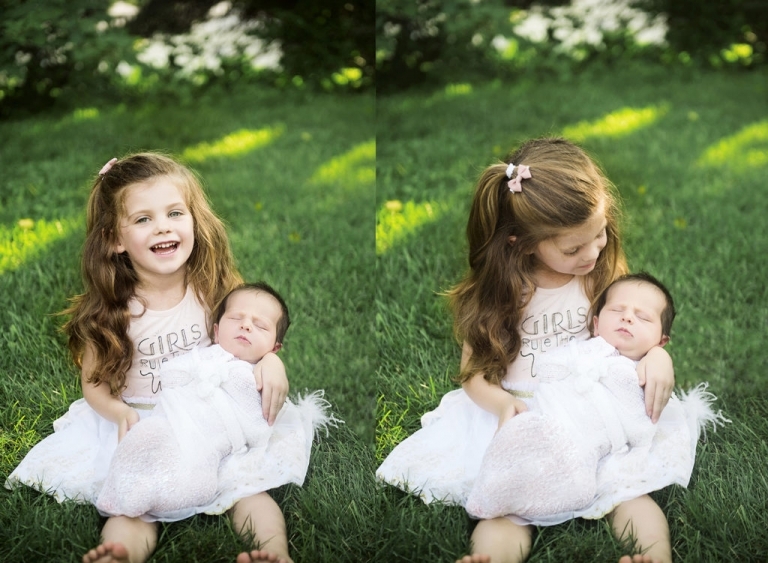 Big sister Coraline was capable enough to hold Adalyn in her lap for some super sweet sister pics, and we even convinced her to wear a dress – no small feat for an independent 3 going on 30 year old kiddo. 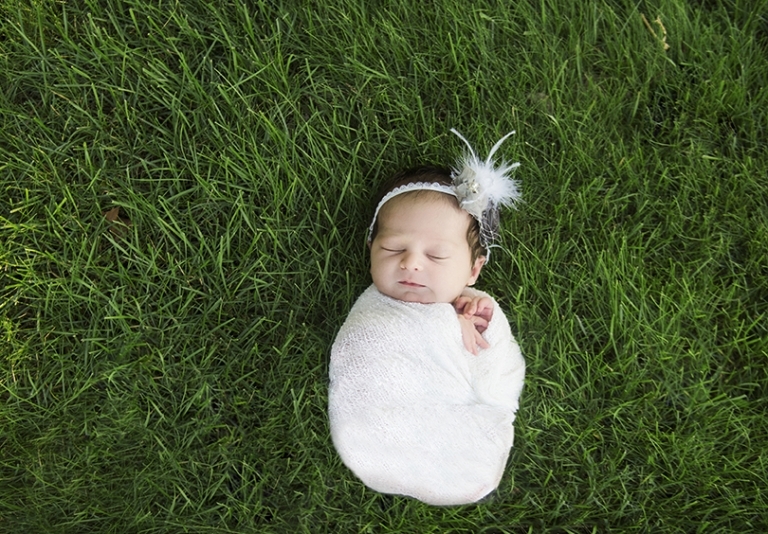 An outdoor newborn photo session is also good for older siblings who don’t like being contained indoors. Coraline fits that description! 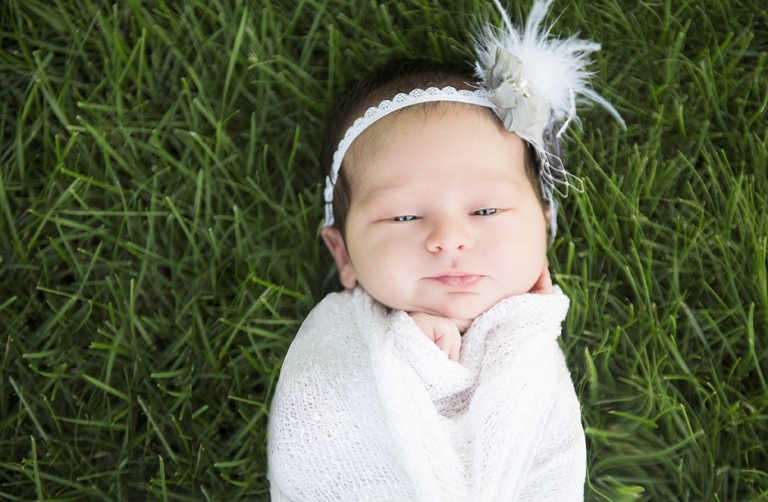 Typically I do not suggest clothing for newborns during photo sessions. Instead, I love using diaper covers, gauzy wraps, fuzzy blankets and custom head pieces (if appropriate). I have a collection of items I bring with me to sessions, but also encourage moms to find their own special things that we can use or incorporate. I also have a variety of vintage boxes, fun baskets, and sometimes even chairs that I can tote with me, but I also love finding treasures in my client’s homes that I can use instead. You never know what might work! For this session, I brought some items with me in my suitcase, and wrapped Adalyn in a white gauze and used a custom gray and white vintage headband created by Deborah Ripley, a client of mine from Dayton OH who also designs custom headbands and other items. You should check out her work! sophiakatedesigns.com Note, don’t let her website fool you – it isn’t recently updated as she mostly does word of mouth, but definitely reach out to her via the site if you want something custom. She’s an artist! Newborns can be tricky to pose. You have to be careful, and patient, and practice wrapping and be ok with constantly adjusting. And even then they might be super alert – kicking and fussing and stretching right out of your carefully crafted cocoon. But man, when you get the shot…it’s all worth it. Adalyn was a very awake baby, and it took her a loooong time to fall asleep, but before that she gave me some great yawns and some really wide eyed moments. Mom’s love wide eyes. I promise. 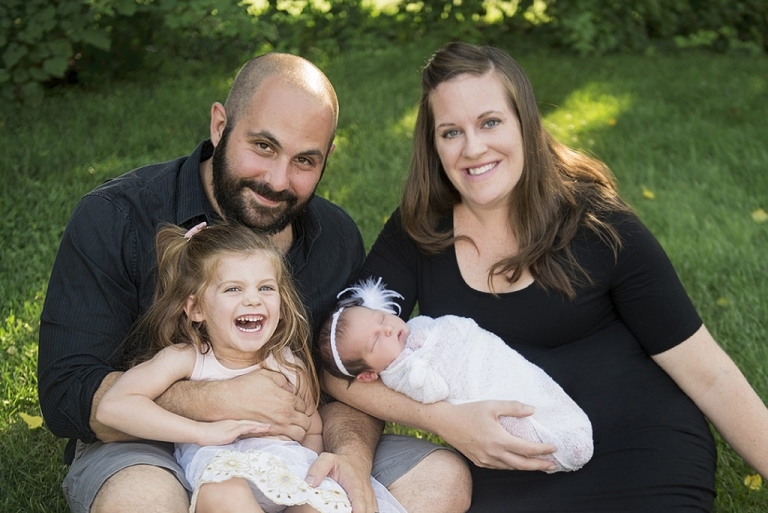 Doing an outdoor newborn photo session in the summer also guarantee it’s a bit warmer, and babies love warm. Wrap them up in a nice little bundle and put them outside (not in direct sunshine, mind you) in the summer and it’s like the womb. I just love me some newborns.